Escomb church in County Durham lies in a circular Celtic enclosure and is probably built on a Celtic base. Unlike later Anglo-Saxon churches it is not Romanesque, but sticks to the basic Celtic floorplan. probably built around AD 690. 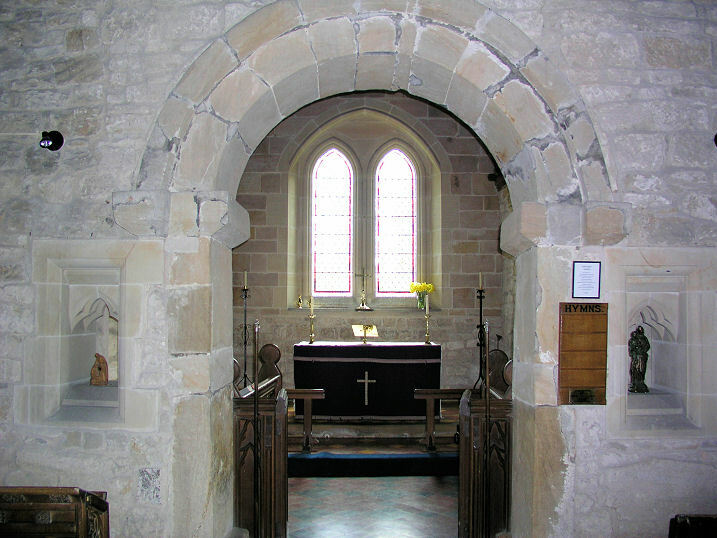 The interior of Escomb church showing the typical narrow arch separating the Sanctuary and Altar from the Nave. Originally the whole of the walls would have been frescoed, some small parts remain. 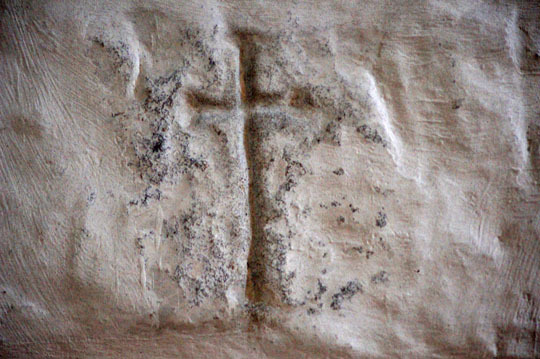 The original Cross behind the Altar – still visible in the picture above showing the arch and the Altar beyond. Perhaps more than is usually the case, this was definitely a period of transition, however it must be borne in mind that the transition was phased over four hundred years. Much more obvious to the people of the British Isles were the savage raids by Danish pirates and invaders which periodically burst upon their shores. In order to gain an impression of the Church in this latter half of the first millennium, we can look at some aspects of its life. This Church in the British Isles had an indigenous Liturgy, which is still well known to us today. It was separate from the Liturgy of the Roman Church and from the Eastern Church (from which it had come at a very early date) although it had elements in common with both. Abbot Benedict brought “masons to build a church…and glaziers for the windows in the body of the church, the chapels and the clere-story” (Those glaziers set up a stained glass school, the remains of which have been uncovered by archaeologists recently) “an abundant supply of relics of the blessed Apostles and Christian Martyrs which were to prove a benefit to many churches…and many holy pictures of the saints…an icon of the Mother of God, the Blessed Mary, ever-Virgin, and one each of the twelve Apostles, which he had across the central arch on a wooden frame reaching from side to side (a Rood Screen) …icons of incidents in the Gospels with which he decorated the south wall and scenes from Saint John’s vision of the Apocalypse for the north wall…and…the Last Judgement” (above the arch). A Rood Beam such as Saint Benedict Biscop may have set up at Saint Peter’s at Wearmouth. The Arch at Barrow church. This is lower – more like a Celtic predecessor. The Anglo-Saxons learned their Christianity from the Church which pre-dated their arrival. Consequently the layout of the “typical” late Anglo-Saxon church is not all that different from that of a Celtic Church. The difference mainly lies in the details of decoration. 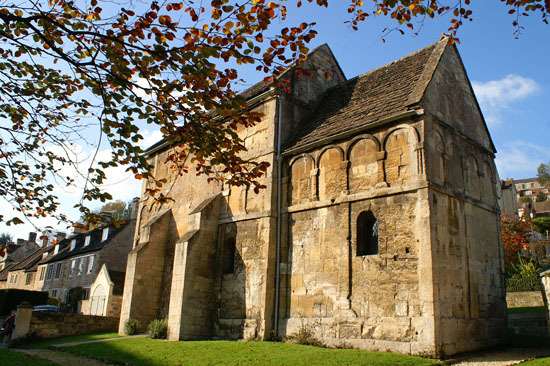 A fairly typical stone church spanning the first millennium was a “two-box” – building as at Saint Laurence Church, Bradford-on-Avon in Wiltshire. The larger “box” being the nave and the smaller, the chancel-sanctuary. 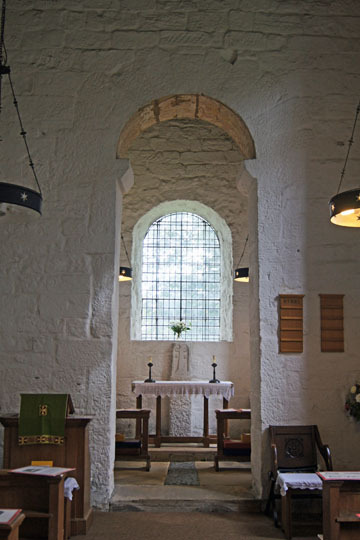 In small churches, they were separated by a stone wall having a single round arch in it. The walls were often plastered internally and some-times externally as well. 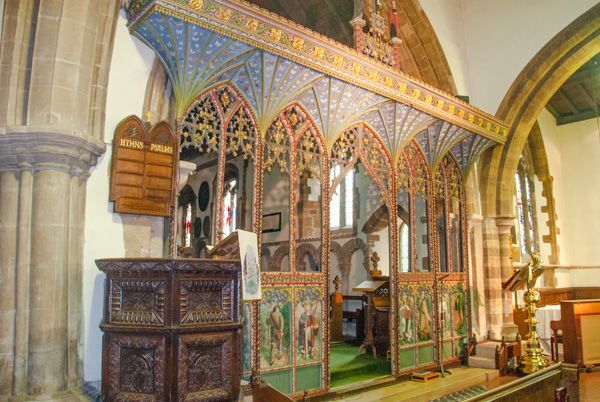 The arch would be filled with something similar to the screen described by Saint Bede above, except that in some cases the arch was extremely small. Saint Laurance, Bradford on Avon. Not a truly Romanesque church either, but definitely Anglo-Saxon and probably built around AD 800s. The interior of Saint Laurance showing again, the Celtic two-box floorplan adopted by the Anglo-Saxons for their much taller churches. 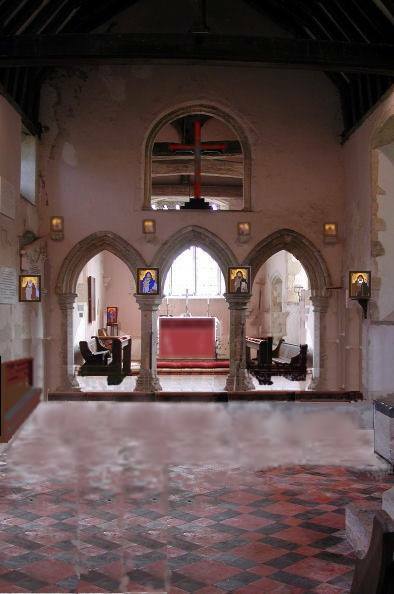 Medium-larger churches might have a third “box” as a narthex and two chapels, one on either side of the main sanctuary which could be apsidal as in All Saints church, Wing, Buckinghamshire. 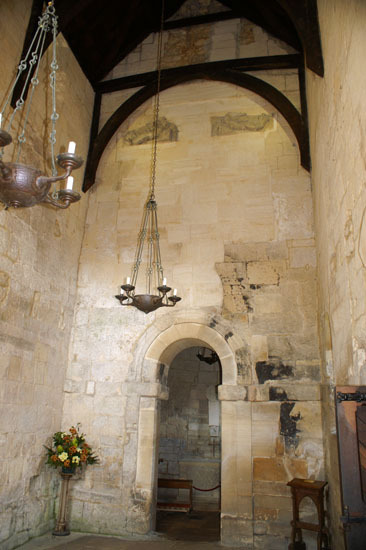 One of the chapels would be used for vesting in and the other for the preparation of the Bread and Wine before the Liturgy, both chapels and the sanctuary would have doors or arches through to the nave. The church of Ss Peter and Paul at Canterbury was typical of this medium size of church. Because people tithed their worldly goods and felt that their temple of worship ought to reflect the glory of God, the large churches and minsters were very richly decorated and furnished. A great abbey would have many crosses of gold, silver, decorated with semi-precious stones, silver tower reliquaries and shrines, icons, many chalices of gold and of silver set with stones and intricately worked, large “discos” style patens and small flat patens, thuribles etc. Particularly of the later period, not only were there independent icons, but also painted frescoes and murals on the walls of the churches. Altar books and Gospels were frequently covered with metal icon-bearing covers. Regarding vestments of the period, perhaps the best example to cite is the set which have survived intact from Durham Cathedral. The stole bears an embroidered inscription which states that the set was made at the order of Queen Elflaed who died in 916, for Bishop Frithstan who held the See of Winchester from 909 to 931. The stole has embroidered on it the figures of sixteen prophets, with Saint Thomas and Saint James at either end, the whole very richly decorated. The matching maniple has the figures of Saint Gregory the Great, Sixtus II Saint Lawrence and Saint Peter, with Saint John the Baptist and Saint John the Divine at either end. 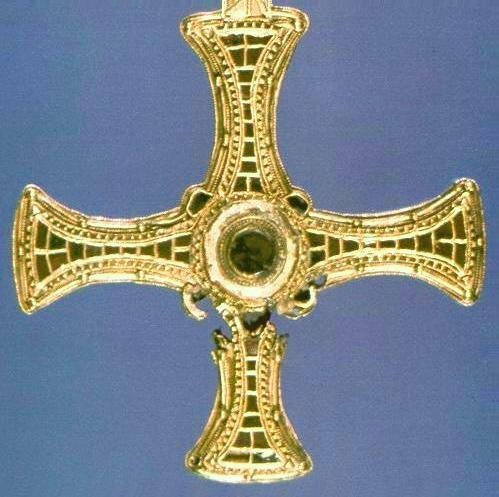 Saint Cuthbert wore an equal-armed gold pectoral Cross decorated with garnet rectangles and a central circular garnet. It had no figure, a feature which is extremely common among pectoral Crosses of the period. The T headed crozier was used by bishops of the first millennium as well as the crook-headed crozier. There is reason to believe that secular as well as the numerous monastic Celtic Priests wore plain, equal-armed pectoral Crosses although whether this was universal or by rank is uncertain. Monks of the early period are believed to have worn plain, unbleached, heavy, coarse woven woollen habits with a full hood and leather belt. They seem to have habitually carried a staff. Secular clergy are believed to have worn black or dark blue cassocks. Later monks wore a darker habit and retained the staff. Despite a “Latinising” party in the newly combined Church, the indigenous Liturgy continued in use in the British Isles for another five hundred years albeit influenced by Roman and Gallican practices. For the next four hundred years, the Church in the British Isles developed, suffering setbacks with the successive attacks and invasions from Denmark and Norway until late in the ninth century. It recovered and reclaimed the lost territories by converting the invaders, as it had done many times in the past. The Church continued as a distinctively monastic church, with distinctive customs, Liturgy and government. Successive Roman and Protestant historians (starting with Bede) have attempted to re-write the history of the Church in the British Isles in order to show a supposed complete subservience to the Papacy. Such was never the case, for while the nominal control of the British Isles may have been claimed by the Popes, their supposed rule was neither certain nor necessarily enforceable, certainly not much beyond south-eastern England. A late church built just before the Great Schism. 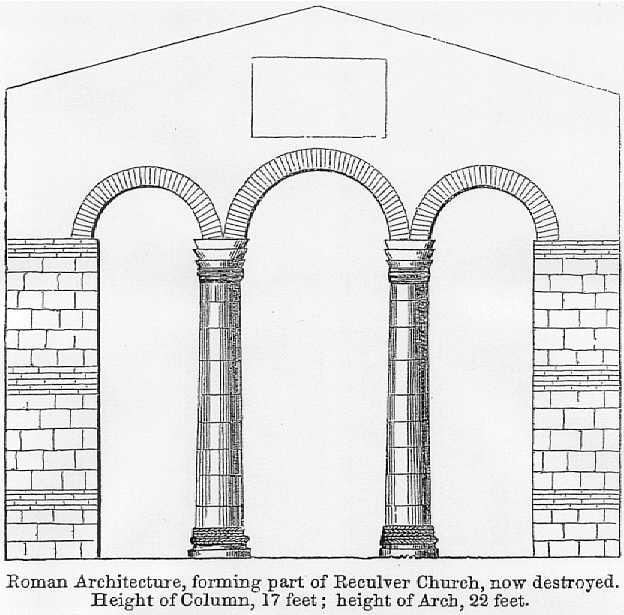 The triple arches are post Schism, however the feature was well known from long before. At about the turn of the millennium, the indigenous Liturgy had developed considerably, with cross-borrowings from the related Church in Brittany and even from Rome. Sherborne Abbey in the west of England had set itself the task of conserving the old customs of the Celtic-Anglo-Saxon Church. It was to this store, that the liturgists turned when the time came to regularise the regional practices throughout the British Isles. Thus came about the beginning of the codification of the British Liturgy which culminated in what became known later as the Sarum Liturgy after the Cathedral at Salisbury. Arbitrarily dated in the year 1054, there occurred the disastrous ‘Great Schism’ between Eastern and Western Christendom. Twelve years later, Duke William of Normandy invaded England and, after the Battle of Hastings took possession of both Church and State. He immediately installed his own bishops who were loyal to the Pope in place of the Celtic and Saxon Bishops. As a consequence, the schismatic papacy gained immediate theoretical control and eventually full control of the Church in the Norman area of British Isles a little over a century later. In 1171, the papal bishops finally suppressed the indigenous Liturgy of the old Church of the British Isles, as they also finally gained control of the outlying areas of Wales and Scotland which had remained beyond their reach for a hundred years after the Great Schism. The Norman Conquest, encouraged and partly financed by the papacy in order that it should procure ecclesiastical control of the British Church, succeeded only in gaining control of the government of England in 1066, and it is doubtful that Rome could enforce her will in Wales, Scotland or all of Ireland until 1150 at best. It hardly seems necessary to suppress a liturgy as late as 1171 which has supposedly (by later historians) not been used for four hundred years unless it was in fact, then in use. The indigenous Liturgy probably continued in Wales and Scotland at least until that time. This means that there is a reasonable argument for the case that the division brought about by the Great Schism was not a reality in those countries until a hundred years after the 1054 Schism, since Papal power could not be enforced there. All Saints Church, Earls Barton was originally an Anglo-Saxon church and much of it is original. 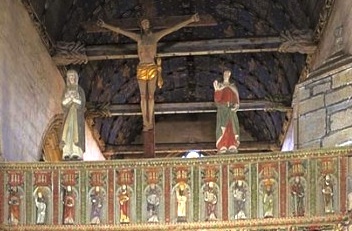 However it here shows the larger Chancel Arch between the Quire and the Nave, with the full mediaeval Rood Screen which became ubiquitous in England. We have seen Christianity come to the British Isles right at the beginning of the Christian era, pretty well at the same time as it spread to Greece and Rome and well before it spread to the Slavic countries. It has been said that it succeeded because the Druidic religion was in many respects, similar to the Christian – trinitarian god, one person of which is said to have had the name “Yesu” – and some precepts similar to those of the Old Testament. The Druids however, had their own problems, since they were viewed with some disfavour by the Roman authorities in those parts of Britain that Rome ruled. The Church in the British Isles developed a truly local flavour, while steadfastly adhering to the faith taught by the Apostles as i attested by great Fathers of the Church at the time. It certainly built strongly on the marked spiritual nature inherent in the people of the British Isles. Some reading amongst the Christian works remaining from the Celtic first millennium will immediately impress upon the reader the remarkable flavour of the Church in the British Isles. This Church had to withstand constant invasions, massive reverses and return to reclaim lost ground. If the Church in the British Isles had and retained a peculiarly not-of-this-world quality, it was because of its strong attachment to the “other world” the feeling of having one foot already there which permeated its writings and liturgical worship. With this faith it endured. The Church of the western Celtic lands (the British Isles, Brittany and part of northern Spain) is in effect indivisible when talking of the first millennium of Christianity. The island of Britain for instance, was divided up into a number of kingdoms and the concept of the “national Church” was really somewhat alien to Christians at that time. It may however be fairly accurate regarding the first two or three centuries of Christianity, to speak of the Church of the Greeks, the Church of the Romans, the Church of North Africa and (among others) the Church of the British Isles (or the Church of the Celts perhaps), but such a regional flavour really belongs to a somewhat later period. Nevertheless, the Church in the British Isles (and parts of western and southern France/northern Spain), if only because of its relative isolation, seems to have initially developed somewhat separately from the geographical Western Church. By the midst of the first millennium, the Church in the British Isles boasted a chain of hundreds of monasteries great and small , anchorite cells etc., spread all over the islands. The most famous ranged from the Whithorn Abbey founded by Saint Ninian in A.D. 395, Iona Abbey (A.D. 563) established by Saint Columba, famous for the outstanding asceticism and sanctity of its monks as well as for its persistent missionary effort, and Melrose Abbey – all in Scotland. In Northumbria there was the great double of Wearmouth (A.D. 674) and Jarrow (A.D. 682), twin monasteries, famous for the scholarship of their monks, Bardsey (A.D. 500s) and Whitby and also Lindisfarne founded by Saint Aidan in A.D. 635 and famous for its school and missionary activities. Hexham Abbey, founded by Saint Wilfrid in A.D. 674. Croyland (A.D. 716) with its anchorites, built on the site of Saint Guthlac’s hermitage in Cambridgeshire. Evesham (Worcestershire), Ely founded in A.D. 673 by Saint Etheldreda as a double monastery. In Wales, Caldey was founded in the 450s, and Bangor Iscoed was founded by Saint Deiniol around A.D. 500. Llanelwy (Saint Asaph’s), was founded by Saint Kentigern in A.D. 500, and had over 1,000 monks by A.D. 570. Llancarvan, known as the house of saints, was founded by St. Cadoc in the early 500s and Llandaff was founded by St. Tielo circa A.D. 530. Llanfechell in Anglesey, one of the most important of the 8th century, was founded by St. Machudd in the 6th century. Llantwit was one of the most famous, monasteries and one of the most active. It was founded by St. Illtyd about A.D. 478 and reached in excess of 1,000 monks within its first half century. In Cornwall, Devon and the west country, there were notable Abbeys at Bath, Padstow, Bodmin, Braunton, Exeter, Falmouth &c and there were many hermits and small houses in Cornwall & Devon. In central and east England, there was Malmsbury Abbey in Wiltshire, founded by St. Maildulph in A.D. 635, Polesworth Abbey, the famous Glastonbury Abbey, Canterbury (A.D. 598), and so the list goes on with many more great and famous abbeys. In the British Church, in the very early period, the Diocese was often administered by the Abbot using the monks as rotated Parish clergy, with the ministration of a Choir Bishop from the Abbey when necessary. Later the Diocese was typically centred on the monastery in which the Abbot-Bishop lived and from which he ruled his Diocese, still using monastic clergy to service the closer Parishes. In later Anglo-Saxon times this principle of a centre of clergy administering Parishes by turn, was extended to groups of secular clergy living communally and serving very large Parishes (known as Old Minsters) having distant dependent churches with resident married Priests. In fact, the decision at Whitby meant little in practical terms if only because enforcing it on a partly unwilling and unconvinced Church was next to impossible given that the Church was spread over a number of kingdoms other than King Oswy’s. The traditions did not ever completely die out. Neither did the Patriarch of Rome gain real the control of the Church of the British Isles until around the twelfth century. Liturgically and doctrinally, the Church maintained much of its own way for most of the next three to four centuries.. The Church of the English and the Britons remained throughout the first millennium, a peculiarly monastic Church with married secular clergy and maintained its own Orthodox Liturgy and Uses. The first recorded monastery in the British Church is that set up by Saint Ninian in A.D. 395 and, given such an early date, it was right at the forefront of the monastic spread from the Egyptian Desert Fathers in that century. The first monasteries in Britain would have been primitive by later standards, little better than simple groups of monks, as was the case with Saint Ninian in Whitehorn. Since this was at least 150 years prior to either the Celtic Saint Columbanus’ Rule or the Italian Saint Benedict’s rule, it could be assumed that the early Rule of St. Basil may have been in use, although whether it had penetrated as far as Britain by that time is open to question. By the time of the setting up of Iona, it seems that the Rule of Saint Columbanus may have been used there. northern Britain in general were sparsely populated or unpopulated, Saint Aidan and his monks went to a wild, isolated open sea island and in this desert experience, almost on the edge of the known world, had faith enough to presume to set out from that to evangelise. Wales, Cornwall and Scotland were the scenes of many individual hermits and small groups creating the basis of the later mighty monasteries in the wilderness, in the most primitive of circumstances. It was really from these holiness-wilderness monastic settings that the Church of Britain was built. As pointed out, monasticism in Britain, developed its own way of running the Church, with the Bishops being part of monasticism and monasticism providing all of the administrative and much of the pastoral needs of the expanding Church in the early period. It was probably only in response to the growing settlement and wide-spreading of the Church, that the old problem common in the rest of the Church, of the outlying hamlets and villages, too far from the main churches, meant that secular, married clergy became necessary, usually earning a living as farmers in their own villages. Such “livings” sometimes later became associated with or dependent on the local feudal lords. 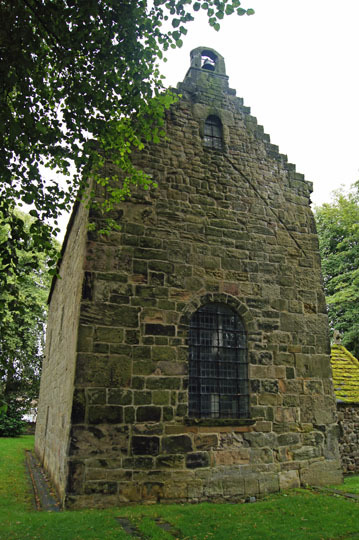 The monasteries also developed daughter houses often also grange-based groups – all able to minister to local populations. learning and as the repositories of knowledge, they became simultaneously the repositories of the culture, as was later exemplified in the monastic writing of the various books known as the Anglo-Saxon Chronicles and the conservation at Sherborne of the English liturgical and other ecclesiastical traditions. Throughout this period, in the histories, we have great and powerful personalities of great holiness. Some were great abbots, others became famous as elders of the Church, advisers alike of kings, prelates and people. In this the Church of Britain was very well served with wisdom and holiness of a very high grade. The external purpose of an Orthodox Monastery is primarily the work of prayer on behalf of the Church, the internal purpose is the sanctification of the members of the Monastery. Monasteries have historically (since the desert Fathers of the middle east in the third and fourth centuries A.D.) been the “powerhouses” of the Church, the places where the Church “back-room” prayer-work is done. often uses them to distract us from concentration on God and His intentions for us. The monastic must see with spiritual eyes and he must be aligned with God’s will. His work therefore will mean an approach which is only rarely recognised by the world as beneficial and he must never be swayed by the popular conception of what is a “good work” any more than the Church should be swayed by the popular conception of what is “Christian”. The monastic has several important aspects to his daily life. Outwardly it is ruled by the formal worship of God in the form of the Liturgy and the Offices (Hours) in the Chapel and inwardly by study of the Holy Scriptures and the Fathers and repentance. The Liturgy is the daily remembrance of God’s sacrifice and the Communion of the community of the people of God, with God. The Offices are corporate prayer services largely based on the Psalms, Bible readings and Prayer. Traditionally they are spread evenly throughout the twenty-four hours of the day although they may sometimes be gathered closer to allow for work activities. Apart from the Hours, there are periods of individual intercessory and other prayer in the Chapel. Monastics aim their lives at the achievement of a state of continuous prayer as exhorted by Christ (Luke 18:7) and St. Paul and the Apostles (Rom 12:12, Col. 4:2, Acts 6:4). The other aspect of the monastic life is the Obediences (domestic, artistic or administrative work which is involved in the upkeep and daily functioning of the Monastery) and any outreach or income-earning work that it does. Article published in English on: 25-8-2009.